We visited Southernalpha.com’s Spark Nashville as part of our next 50 stop leg on our sneaker-strapped startup road trip. One of the biggest key’s to our success has been getting out in the trenches with startups everywhere else. Southernalpha.com was founded by Nashville serial entrepreneur Marcus Whitney and Walker Duncan who serves as the sites Editor in Chief. They cater to “High Growth Technology for the South East” specifically Nashville and New Orleans. 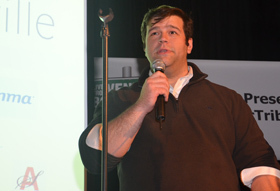 Armed with a seed investment of $150,000 from Duncan’s father’s venture capital firm Solidus, they’ve ramped up nicely and attracted a couple hundred local startups, entrepreneurs and power players to 3rd and Lindsley in Nashville last Thursday. Whitney, Nashville Technology Council’s CTO of the Year, serves as a visionary and advisor. At the event Whitney credited Duncan and Southernalpha’s Marketing Director Kelley Boothe with the great turn out that saw 11 startups from across Tennessee pitch in a competition for $1000 dollars and an iPad. Southernalpha.com launched during the late summer. Despite the early investment the site is struggling to gain traction outside of it’s inner circle. Duncan is no stranger to journalism. He left his post as the Health Care, Manufacturing, Technology and Tourism Reporter for the Nashville Post, a publication also owned by the elder Duncan’s investment firm, to start SouthernAlpha. As for the event itself, it was alive with startups, entrerpeneurs and investors. It kicked off with a fireside chat between Duncan, Whitney and Nick Holland the founder of CentreSource and now Populr.me. The discussion was great, highlighting why Nashville has such a strong startup community and many lessons Whitney and Holland learned growing their businesses in Nashville immediately following the first dotcom bubble burst. Holland and Whitney talked about being inspiring and the yes mentality. They also shared the dumbest thing they’ve done as an entrepreneur with the audience. After the pitches there was more time for networking and people stuck around well into the night. For more coverage of this great event click here. We’ll be in Lexington KY, Cincinnati, Columbus, DC, Austin, Kansas City and even Silicon Valley, all in the next 5 weeks on our sneaker-strapped startup road trip. Were you one of the 1287 people at everywhereelse 2013? Don’t miss everywhereelse 2014 with a stronger lineup, more panels, even better parties oh and free breakfast and lunch, click here.